With a clutch of stylish new hotels and market-driven restaurants, the historic town—a hot-springs retreat dating back to the Romans—is making another splash. The Romans would have gotten it, I thought as I took handfuls of lavender-infused ice and rubbed it over myself, wincing a little. They themselves did not get around to developing the technology needed to cause this stuff to spill out from a carved-stone lion’s head set into the wall of a spa. But they would, surely, have loved the sheer opulence of it. It turns out that massaging oneself with lightly scented ice isn’t such a bad thing when the next move might be to slip into a steam room or, better yet, to immerse oneself in the naturally hot, faintly sulphurous waters that rise here in the city of Bath, in southwestern England. I was in the Gainsborough Bath Spa, a hotel that, I suspect, provides the most luxurious way of enjoying the waters’ curative powers since the Romans established their vast temple complex here in the first century A.D. Shortly after the ice moment, I was beckoned into a side room, where I was scrubbed, massaged, and treated with hot stones for 90 minutes. Left: The Gainsborough Bath Spa, a former hospital. Right: Pork belly, quail, and apple salad at the Pony & Trap, a Michelin-starred pub outside of town. The owners of the Gainsborough had to be particularly patient during its conversion from an early 19th-century hospital into an elegant 99-room hotel with a sumptuous 14,000-square-foot spa. If you dig in Bath, chances are you’ll end up having to call in the archeologists, and so it was here. In 2007, right below the hotel, a team excavated one of the largest hoards of Roman coins ever discovered in Britain: 17,577 of them, to be precise. A few are on display in the hotel lobby. Most can be seen on a visit (two minutes’ walk away) to the Roman Baths themselves. It is one of the most impressive archeological sites in Britain: there’s the bronze bust of the presiding deity Sulis Minerva; the temple pediment with its great carved head of a snake-bearded Gorgon; and, of course, the sacred spring, which bubbles constantly and, on a cold day, mists the air with its curling steam. If you dig in Bath, chances are you'll end up having to call in the archaeologists. The Roman Baths eventually fell into disuse, perhaps already silted up by the time the Roman administration officially severed ties with its most northwesterly province in A.D. 410. By the medieval period, a legend about Bath’s origins had grown up around the mythical King Bladud. The story goes that Bladud left his father’s court because of his leprosy and became a swineherd. One day he saw his sows immersing themselves in hot spring water, so he, too, bathed and found his leprosy cured. Returning home, he was restored to his royal rights. He would later build Bath on the site of his pigs’ wallowing hole. “Taking the waters” became a craze in 18th-century Britain, and speculative architect-developers such as the father-son partnership of John Wood the Elder and John Wood the Younger rapidly expanded Bath into the elegant, tourist-friendly city we know now. 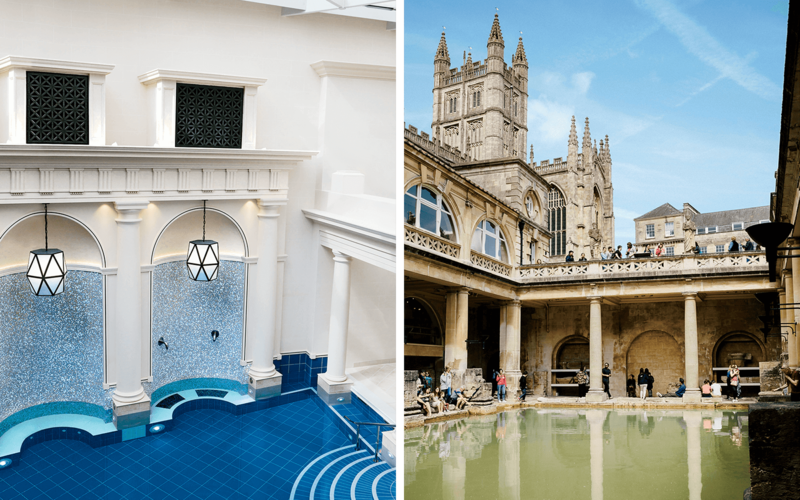 Today, the Roman Baths — along with Bath’s immaculate Georgian architecture, immortalized in the novels of Jane Austen — are the reason visitors come. Although the historic town was named a UNESCO World Heritage site in 1987, during the past decade various architects have given it a modern touch. There’s Nicholas Grimshaw’s glass-and-steel structure topping off the Thermae Bath Spa and Eric Parry’s ceramic-and-glass-cube extension to the elegant Holburne Museum, which houses an exquisite collection of European art and decorative objects. Bath has had an air of fustiness in the past — a slight dishevelment about it. That’s part of its charm, of course. But the arrival of the Gainsborough and a few recent hotel openings, along with a handful of serious chefs in the area, have helped smarten up the place. The Gainsborough takes its name from the English painter Thomas Gainsborough, who moved to Bath in 1759 to seek commissions from the wealthy clients who frequented the spa town. It is the only hotel in the city to have those hot waters flow directly into it. (Three of the hotel suites feature bathrooms with an extra tap that filters the thermal waters right into your private tub.) The spa’s main attractions are the various plunge pools, but guests can enjoy everything from the infrared sauna to a Malay massage or an aqua yoga class. After indulging in the sybaritic activities of ancient Rome, my friend and I visited the newly opened No. 15 Great Pulteney, which is a popular spot for afternoon tea. Here, three Georgian town houses have been converted into an eclectic, art-filled hotel. 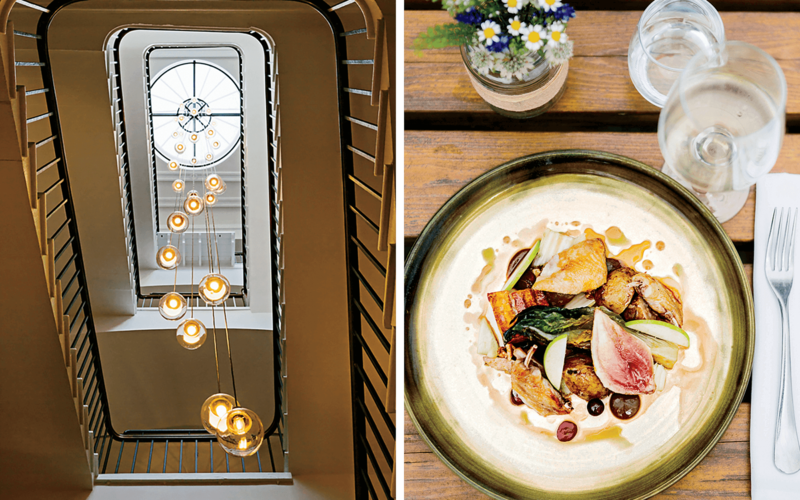 It’s a new kind of luxury for Bath: not the chintzy formality of old-fashioned English hotels, but a cooler, more modern feel. That fresh vibe can also be found at the nearby Canary Gin Bar, the home of the Bath Gin Co., a local distillery established in 2014. Cocktails are mixed with both the home liquor and a bewildering number of guest gins whose virtues are enthusiastically discussed by the young mixologists. It’s a far cry from the standard English boozer. Left: The main pool at the Gainsborough Bath Spa, where the town’s famous waters flow directly into the hotel. Right: the ancient Roman Baths. Some seven miles outside the city, tucked into Somerset’s rolling hills, the Pig Near Bath is a beautiful 18th-century manor house that bills itself as a restaurant with rooms. Don’t let the casual atmosphere — wood piled up in the entrance next to a collection of wellies — fool you. The kitchen here is ambitious: They aim to source nearly everything from within 25 miles. In fact, a good deal of the food comes from considerably less far afield, since much is grown in its own sizable garden: we poked around greenhouses, admired fruit cages and pert rows of chard and leeks, and watched the deer skittering through the fields; some would later supply venison for the dinner menu. Bath is typically visited for its urban pleasures, but the surrounding landscape is worth exploring. The next morning, we strolled through the garden and saw the kitchen staff harvesting leaves and vegetables for later; no one minded us pinching some sprigs of mint to make an infusion. Just around the corner from the fish smokehouse, we visited the hens who’d provided the eggs for our breakfast. A pleasing snuffling behind some greenhouses announced the presence of the pigs for which the place is named. Breakfast was a necessary fortification for our upcoming 10-mile walk. Bath is typically visited for its urban pleasures, but the landscape surrounding the city is worth exploring, with its charming villages, historic houses, and strange monuments, such as the cluster of neolithic stone circles we came upon at the edge of the tiny hamlet of Stanton Drew. Despite the grandeur and scale of the circles, we were the only visitors admiring them. The architect John Wood the Elder was also fascinated by these mysterious megaliths. In the 18th century, he studied them (ignoring warnings from the locals, who superstitiously claimed that anyone who went near them would be “struck dead upon the spot”). Wood theorized that King Bladud had established the stones as a map of the stars according to a principle he taught to the Greek philosopher Pythagoras, who in turn used it as the basis for his famous system of astronomy. Bizarre as Wood’s speculations may have been, I’m grateful for them: the monument’s circular form is thought to have given him the idea to build the Circus in Bath — the first circus in English town planning, pre-dating London’s Oxford Circus and Piccadilly Circus — which, along with the Royal Crescent, is the most celebrated of Bath’s architectural wonders. 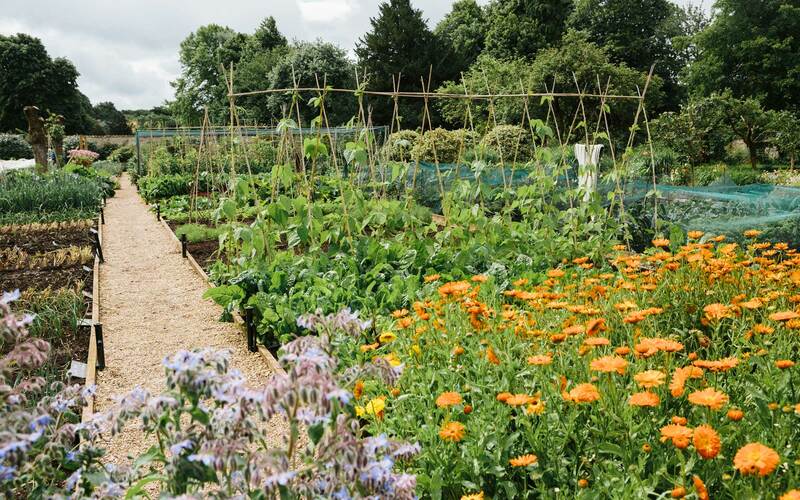 The vegetable garden that supplies the kitchen at the Pig Near Bath hotel and restaurant. Our exertions brought us to the Pony & Trap, a nearby pub. It has a Michelin star, but not an eyebrow was raised when we walked in caked in mud and late for our reservation. Like a growing number of the region’s chefs, the 33-year-old Josh Eggleton (who trained in California at the French Laundry) likes to showcase the local bounty, working with nearby community farms to source produce and using game shot right in the valley. We went for fish, enjoying an expertly prepared slow-poached salmon and grilled brill fillet. After the meal, when our attempts to find a taxi failed, the staff took it upon themselves to telephone the Pig to send a rescue party (within minutes, a delightful young man in a Land Rover arrived). As the Pony & Trap’s assistant manager remarked, “the valley’s a small place.” The region may be small, but it’s certainly gotten more sophisticated.